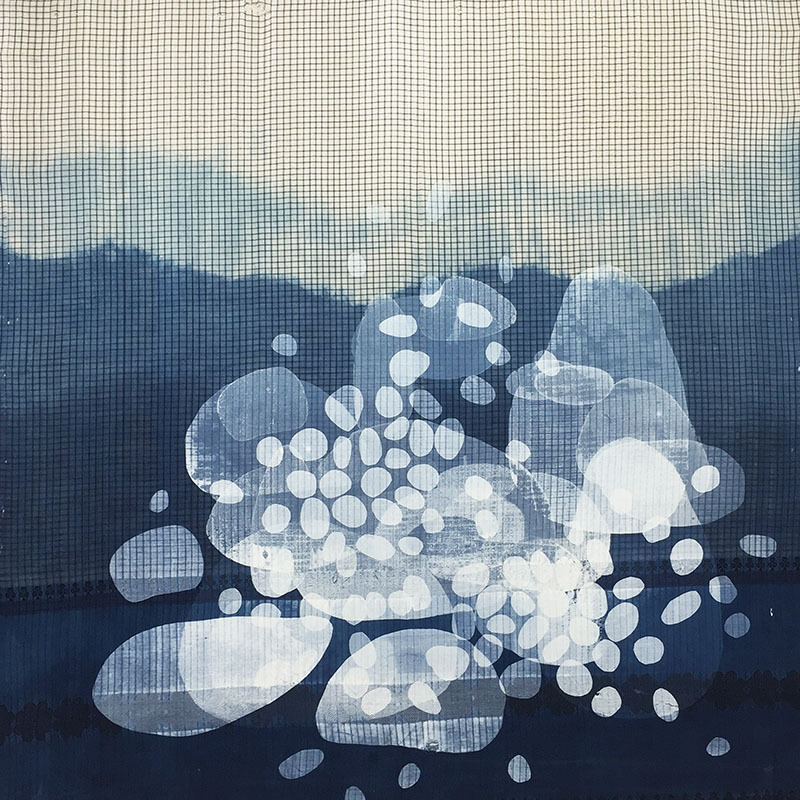 Accumulation is a mixed media exhibition featuring current and recent works by Nirmal Raja and Leslie Vansen. This show has evolved from their shared interest in accumulation and complexity, and investigates their understanding of the present moment. Themes of figurative presence in space, perspective shifts, layered and simultaneous experiences, and dualities are explored using repetition, accumulation, scale, and medium. The intangible and the ever changing are fascinating places to explore in my work. As a transplanted individual living between two cultures, I am constantly trying to identify where and how I fit into a place. Liminal concepts like memory and perception of time and space are natural extensions for this exploration. I address remembrance as transitional: how we add to, subtract from, and refract our memories and our understanding of location. I do this through experimenting with materials and techniques. The Shadow Accretion series explores the slow accumulation of experiences as we pass through life and how each experience impresses its shadow on us and changes us in incremental and often unnoticed ways. I mimic this process using a printmaking method (diffused relief printing) that is an accretion of impressions that are translucent, layered and sometimes barely noticeable individually. Gathering Moss is a tongue in cheek response to the age-old saying that “a rolling stone gathers no moss”. I believe our lives are a slow accumulation of experiences that impact and change us in incremental ways. Simple forms when multiplied become strong statements much like the cairns by the beach that personify balance and stability. In this body of work, I respond to collected silk and cotton sari fabric, manipulating them with dye and screen printing. The images in my paintings are literally, concretely "constructed" from obvious "abstract" components of visual forms - surface, lines, color, space. These embody a repetitive continuum of memory and association with nature and architecture as experienced daily in an urban context. No reference to one place or moment is intended; cumulative sensations of existence become visual force fields and remembered repetitive interactions. Cyclical events which shape space, control form and encourage or inhibit change are evoked metaphorically through methodical applications of paint which conceal and reveal their layered identities. The paintings’ scale corresponds to my own physical presence in space; their surfaces report the actions of my body. The paintings are chaotic meanderings intersected by imposed structural grids. The juxtaposition of meander and structure generates "time," postpones solution and avoids hierarchy. The dynamic limbo and inherent contradictions within order, chaos and inexorable outcome give the work its associations with nature and the familiarity of social interactions. Where expression is possible here, it is accessible via analogy, metaphor, tactile presence, and viewer confrontation. Every procedural tactile step taken in the construction of the paintings is made insistently visible, recording the “work” that has made the existence of the finished painting possible. At the same time, the logic of that visible process is “hidden in plain sight” in the final image. Duration and methodology consume themselves to disappear into the history of their own making and become something else, obvious, unavoidable and quite different from the original intentions. LESLIE VANSEN teaches painting and drawing courses from introductory through graduate levels. She makes acrylic paintings on canvas, paper, and paper board that are presented regularly in invitational and juried exhibitions, and are held in numerous public, private, and corporate collections nationwide, including both the Milwaukee Art Museum and the Racine Art Museum. The paintings present metaphoric investigations into the functions of work, time, and repetitive figurative movement through space, suggesting, by analogy and abstraction, the residue of human action on its immediate environment. Her work was most recently featured in the “Systems for Abstraction” exhibition at the James Watrous Gallery in Madison, Wisconsin and the 2015 exhibition, “Interface: Meetings of Art and Technology” at UWM’s Union Art Gallery. During 2014/2015 she produced the animation projections for the UWM Dance Department’s restaging of Trisha Brown’s Set and Reset. In 2008, Vansen collaborated with Luc Vanier (Dance) and Christopher Burns (Music) for the Peck School of the Arts production, Triptych, and was the subject of a solo exhibition at Lawrence University’s Wriston Art Center Galleries. NR: Some of the first things I made are not really defined as “art” in the conventional sense of the word. I grew up in India with a rich culture of indigenous aesthetic traditions that are embedded in ritual, religion, and culture. I grew up making ephemeral sand drawings every morning with my grandmother during the summers when I visited her. These drawing are called rangoli, muggu, or kolam depending on the region in India. Rangolis are made using lines that either go around or connect a grid of dots. White sand is used on freshly mopped earth in front of the home and these designs slowly disappear through the day as people walk and drive over them. Fresh designs are made again in the morning. Notions of ephemerality, impermanence and change still remain strong influences in my work. LV: My earliest memories of making things are a kind of constant activity in my childhood home where “making things” happened all the time. The materials were usually paper and crayons or tempera paint. Linoleum cuts for Christmas cards were added materials once the “sharps” became tools and not dangerous weapons. NR: I felt the creative impulse for as long as I can remember. The art classes at school were very minimal but I remember enjoying them tremendously. I didn’t have much access to art materials and I enjoyed making drawings with simple graphite pencils on notebook paper and loved doing scientific illustrations for science classes. I knew that was the only thing I wanted to do when I grew up. NR: I started using materials in an expressive and communicative way only after coming to the United States about 25 years ago. Migration remains one of the most important influences in my work. Notions of displacement, the passage of time, and the malleability of memory continue to be persistent themes that I explore. None of my work would have been possible without the support of my husband. His continued and unwavering interest in my work is what keeps me going. He is my first critic and my sounding board for ideas. Our conversations are rich with explorations of the big and small questions of life that eventually make their way into my work. LV: My mother was a constant influence from the beginning (artist, art activist, art teacher, art fund raiser, community art organizer, exhibition juror, newspaper art critic, art mentor, you name it!) Two teachers were also instrumental. One was a seventh grade art teacher who encouraged me to go to a Summer Art and Music camp at the University of Kansas in Lawrence. That experience made me realize the people my age took art making very seriously and were extremely inventive and skilled. The second teacher was as printmaking faculty member at the University of Iowa, Virginia Meyers, who talked constantly about how one never stops being an artist and what that could mean outside of a classroom. NR: Other artists inspire me a great deal. I learn different strategies of approaching subject matter. Mostly, I like to listen to artists talking about their work and how they resolve certain obstacles in their work and careers. Some of my favorite artists are Bill Viola, Clyfford Still, Agnes Martin, William Kentridge, Kiki Smith, Zarina Hashmi, etc. I am also inspired by indigenous art forms and materials from India and other cultures. I continue to read about various subjects such as philosophy, culture, physics, and spirituality. Research is a big part of my work. LV: Being in all kinds of landscapes (walking, biking, hiking, camping, cooking) has been a constant source of ideas and imagery for my work. Desert and mountain trails have been especially important for their duration, light, and simultaneous visual continuity and surprise. Other people’s art and the arts of other cultures and times also play a constant role in my thinking and making. Much of this kind of influence came about in my first full-time teaching job with regular access for six year to museums in Massachusetts, Connecticut, and New York and with travel to museums all over the U.S.
NR: Early childhood art education in elementary and middle schools was non-existent when I grew up in India. It is very different now of course. I wish I had more access to art materials and guidance in how to express myself during my childhood and teenage years. LV: I was extremely fortunate to have had so much opportunity as a child and student and then immediately after my degree programs when acceptance into juried shows (those are not very frequent anymore!) and teaching were immediately part of my life. It’s hard for me to ask for “more” when younger, when “more” was a lot of what I had, even though it took me until I became an adult to realize the value of those experiences. NR: Never give up. Keep on trying and pushing forward however minuscule the progress might be. Nothing beats persistence and hard work. Connect with other artists. Never stop learning and trying new things. LV: Do it! Don’t stop. Every day. NR: Sometimes I do and sometimes I don’t. I am always curious about how my work is received by the viewers. I find it fascinating to see what connects with people and the subjectivity they bring to the conversation depending on their own life experiences. Sometimes I find this confusing if the work is unfinished and people are reacting to it with their own opinions of what the work should be. But sometimes, it unlocks a solution that I did not anticipate. Ultimately I strive to keep my response authentic and honest. LV: I’ve learned to work with observations and commentary on my work while it is in process. In earlier years – or when my process was/is in the midst of upheaval, the observations and commentary have not always proven to be productive. The commentary is very helpful when I am learning new approaches or taking on new technologies. Limited studio time makes regular visits to my studio by other people difficult and hard to plan for. My work requires solitary activity and quiet without interaction a lot of the time. Otherwise there is too little for anyone else to see or comment about. NR: When the weather is good, I like to walk by the lake. I find this time very inspiring and valuable for percolating ideas. I also like to start my day in the studio with either reading a little bit of art theory or listening to other artists speak about their work. LV: The closest I come to “daily” in terms of routine or ritual is an early morning walk. That is a never fail activity and provides a constantly renewable source for sensory memory which actively feeds my painting processes. Other helpful routines occur during walks or bike rides to the studio. Those 15-30 minutes allow for emptying out whatever work place or home project thinking has been occupying my time until those transitional times to studio thinking take over. NR: I try to keep my media choices wide open and choose materials and processes according to the subject matter. I try to teach myself or approach other experts to learn new techniques whenever possible. I also really enjoy bringing materials from India and incorporating them into what I make. This feels right as I am a blend of the two cultures and this translates into my work as well. LV: My studio activity is pretty traditional. It’s hard to say that any aspect of it is unusual. Even my headphone listening to block out distraction is not unusual. I don’t always hear what is on the CD’s because I’m focusing on making the work; I doubt that is unusual either. LV: No; I’ve always worked either full time (for most years) or part-time. NR: I have a diploma in graphic design and desktop publishing from the Moore College of Art and Design. But I found out very quickly that my calling is in fine art. However, the design skills are invaluable in my art practice. LV: I have been a faculty member (from part-time instructor to Full Professor for more than 45 years (I’ve also been an art partner with my husband, and a mother and grandmother.) Teaching has provided an incredible set of demands and new knowledge from the beginning. It made “always being a student” at some level a fact of my painting life. The primary example of that is the Art Survey lecture course I taught for UWM for about 26 years. That required a constant upgrading of research into “contemporary studio practice” and critical theory starting in 1978 and running through 2001. Art Survey was a two-semester course intended to introduce Art & Design majors to contemporary practice right from the beginning of their degree work. “Contemporary practice” evolved a lot during those 26 years – starting before feminist, multicultural, African American, global and digital art practices, and occurring during the many transitions between “modernism” and “postmodernism.” Art Survey also introduced Art & Design majors to the studio disciplines offered in the department, so I worked to offer survey levels of introductory material from artists well outside my own discipline – using some volunteer colleague lectures and lots of brand new disciplinary research into photography, fibers, jewelry/metalsmithing, ceramics, and sculpture especially, but also into printmaking and contemporary drawing – both of which I know lots about but hadn’t explored in terms of current artists and ideas. What influences came out of all this? No direct artist or way of working comes directly into my work but the range of possible forms, intentions, and career goals among contemporary artists (as these have changed over that time) has been incredibly helpful and liberating in terms of support for sticking with what is now a fairly obscure activity – painting on canvas in an individual studio without assistants! Those courses also expanded my critical expectations for my own work and for art that I seek out to study. NR: I cannot imagine doing anything else. Not everything can be verbalized, explained, and analyzed. To me making art is to communicate the felt and the ineffable. NR: The role of the artist in my opinion is to observe what is often overlooked and to call attention to subtleties and macro or micro perspectives that go unnoticed or to identify larger patterns that are too entrenched in our lives to be recognized. Art is important because it helps us look more carefully, develop curiosity, and experience life more fully. LV: I am committed to the importance art can have in society but I also question its role and significance constantly (this questioning started as an undergraduate during the civil rights movements era when many of my friends drove south to teach). NR: We are increasingly becoming a mono- everything society. It is dangerous to think that there is only one perspective and one way to see and experience the world. Art gives us a peek into another perspective and provides a platform for dialogue on innumerable subjects. Supporting the arts is supporting the very soul of a culturally rich society. LV: The arts are a place where problem solving is a constant requirement for the makers. Supporting problem solving in all times of stress and change and conflict is essential. The voice which art can give to groups, individuals, communities is irreplaceable and not replicated by other forms of endeavor and production. Moments of shared understanding, passion, and insight which art provides are essential to our wellbeing and our humanity. Arts require reflection. Where would we be without reflection? NR: This body of work is mostly inspired by my experiences in nature. I love hiking in the woods and walking by the lake. I am fascinated by light filtering through the leaves and love walking over those cast shadows. “Shadow Accretions” are derived from creating templates from pictures of these cast shadows. “From the Lake” and “Scatter”, “ Stack” and “ Shimmer” are inspired by my walks by Lake Michigan. I collect interesting rocks and pieces of branches and other items that have been worn down by the currents. I’ve been long fascinated by how something so fluid as water can shape something so solid as stone. The round smoothness of eroded rocks and stones each have a personality of their own and I like looking closely at them. Patterns and textures emerge and are absorbed into the mind and often come out in my work–for example the group of etchings. LV: My current body of work is an extension of my long standing investigations into what I call “constructed color.” These investigations began just before 1990 and have evolved with updates and palette shifts ever since. Inspiration comes primarily from observations of figures moving through space and remembered observations from my own “seeing” while walking and riding a bike on a daily basis. The memories of “seeing” are cumulative, not specific to time or place. The most recent paintings closely follow a year long effort to produce a video animation from my “SiteLines” drawings as part of a collaboration with UWM dancers, a Trisha Brown dancer, and UWM dance faculty members for restaging Trisha Brown’s 1983 "Set and Reset" in 2015. I attended a Trisha Brown dance concert presented at Alverno College by her company and a site specific Trisha Brown company performance at Lynden Sculpture garden. I saw a major documentary exhibition of the Trisha Brown archive at the Getty Museum in Los Angeles, studied Trisha Brown’s drawings and dance drawings, and saw video documentation of "Set and Reset" restagings by other universities and dance groups. NR: I am what you may call a “process junkie”. I am constantly learning new techniques online and from others, I love exploring the potential of all materials and choose materials according to the subject that I am exploring. I used my mother’s saree fabrics in some of the work as it refers to the body and how clothing is especially potent with residue of one’s experiences. LV: I began painting with acrylic in graduate school in the 1960s as acrylic paints became more commercially available. I used both oil and acrylic for about eight years after completing my MFA work but switched to all acrylic when my studio was in my home while my children were very small. The pigments are of course toxic but the solvents were eliminated from the home environment for safety reasons. During the same time period that my medium became primarily acrylic, I worked on a series of screen print editions that began with drawn source images and evolved to images that grew directly out of the photoscreen stencil making process. This time period also coincided with yearly 12-week travel during the summers so that there was no studio access. These twelve weeks turned into my drawing time because the materials were portable. The remaining nine months of the year were then used to mine those drawings for paintings and screen printing images. NR: A very important role as it has to be the perfect match to the idea. LV: Process is integral to almost every aspect of my work. Process sustains the disparate components of the source work as it is translated from drawing into painting. Process allows for interruptions in the production of the paintings because it can be activated from where ever I am and quickly whenever I am in my studio, whether that is for a short time or a long time. Process takes the disparate source materials which are put through repetitive and reiterated actions far past their original identity into new forms that I expect to find but don’t fully predict. Process continues outside the studio in the form of drawings which occur where ever they need to and in the mental preparations for exiting the studio and then returning to it after an absence. NR: This is hard to explain. I just do. I used to have a tendency to over work and go a little too far. So, I trained myself to reassess more often, and also have come to understand the importance of “less is more”, and have grown fond of brevity. LV: When it becomes apparent that continuing with work on one painting will be the start of a new painting, I know the painting is complete. This awareness of starting again takes only a short time once in awhile, but usually takes several weeks (during which I work on other pieces). Slow process. Slow thinking. NR: Look more closely at your surroundings. Have a variety of experiences and let everything seep into your life and work. Beauty is everywhere if you choose to identify it. Take a moment to find wonder and contemplate on it. LV: If people can realize that they have discovered more than one thought from looking at my paintings, then they have begun their own dialogue with the work.